Motivation: I was too tired to have motivation. Moved: I walk-jogged 2.5 miles. I forgot to take my inhaler this morning so I was a mess by about 1 minute in. Felt: SO TIRED! I came home barely able to stand and passed out HARD for a few hours. Etc: I split my sleep again, napping for a few hours in the morning and then again before work. Gratuitous Cat Picture: Throwback to last year when I was in Italy. Motivation: Just over a week left! Ate: Latte, PB&J, saltines, 60oz tea, 12oz water, hummus with pita chips, Mod Pizza with just red sauce and garlic (mmmmmmmmm! garlic *_*), and then a mocha because I'm dumb. 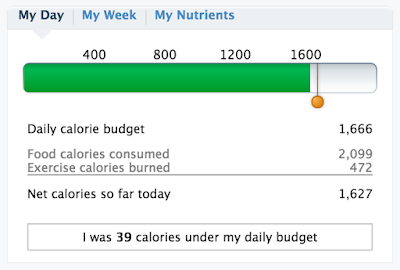 I overate by 32 calories because I underestimated how many calories would be in the mocha. Moved: 45 minutes of yoga, BUT the stupid MapMyRun app CRASHED 12 minutes in so it thought I did way less exercise than I actually did. uuuugh. I need to find another activity tracker. Felt: tired again, or maybe I'm just confusing my eyes stinging for being tired? Etc: I think I'm allergic to my asthma inhaler, but I have a prescription for a different one that I'll be filling in another week or two. Maybe that one will help? Now Crackers is weirdly invested in Full Metal Jacket.